With the new patch on its way (v238), Drake was so nice to share a screenshot of the upcoming Woolly Rhino! And it sure is woolly. Hopefully the three announced creates will soon come to an ARK near you, as we cannot wait to see them all in action. For now you’ll have to do with a screenshot of only the Rhino, but as soon as more information is released, we will be sure to update you on it! 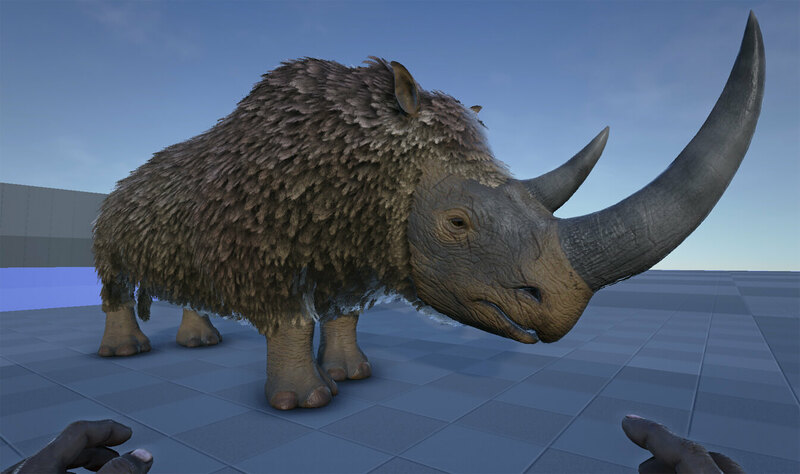 What do you guys think about the woolly rhino? Is it what you expected it to be or had you hoped it would look more majestic and fearsome (after all, it looks a bit on the cute side we think)? Update: more screenshots have been released, including the Dunkleosteus and Eurypterid. Head over to this post to check it out. they destroyed the woolly rhinos looks!!!!!!!!!! its going to be cool to see it in game but it doesnt look like i thought. i thought it would be the power of a trike and the chargeing of a pachy as a hybrid mount but now it looks bad. i cant wait however till the colored manta titanosaur and arthropleura have arrived. enyone else think we need gorgonopsid in ark? Gorgonopsid is i must in ark! I hope they deal a ton of knockback. Looks realistic to me so I like, they butchered the Terror Bird and Dire Bear though. Trying to make them cute and cuddly.